When you’re going to be working high up off the ground on a work platform, safety becomes even more important than usual. Having safety precautions in place protects workers from injury and pushes the operation forward. Watch this video for a refresher on scaffolding safety. If you’ve never been trained to use scaffolding, then you shouldn’t be up on a work platform. Workers should know how to build and disassemble scaffolds as well as how to safely work with the necessary tools and materials. 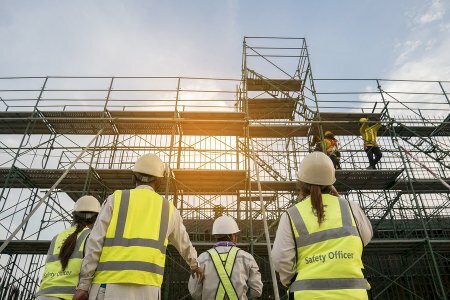 Whenever a scaffold is used, a scaffold expert must be there to design the platform and keep an eye on the workers to make sure they’re following protocol. Before you get up on the scaffolding serving Washington, D.C., know how to keep yourself out of harm’s way . At Scaffold Resource, we provide your company with the work platforms you need. Call us at (301) 924-7223 today. You can’t get too far without making connections these days, and if you’re an industry leader, you should be happy to network with other business entities. At Scaffold Resource, we’re proud of the many connections we’ve made and the affiliations that we are a part of. Read on to put the spotlight on our industry affiliations. The professionals at Scaffold Resource are lucky enough to be affiliated with some of the most important and influential entities in the industry. We’re a proud part of the Associated Builders and Contractors as well as the SIA, or Scaffold Industry Association. You will also find the D.C. Chamber of Commerce, American Subcontractors Association, and Washington Building Congress among our network of affiliates. These partnerships mean shared resources and continuing education, which contributes to safer and more efficient scaffold operation in the D.C. area. The Scaffold Resource team is just a small part of a much larger community that’s dedicated to promoting safe and efficient scaffolding serving Washington, D.C. Call us at (301) 924-7223 if you’d like to work with us, learn more about our industry affiliations, or ask us about our work platforms. Working with scaffolding and shoring can be dangerous, especially if you are inexperienced or untrained. Even if you’ve been in the business for years, all it takes is one mistake to end up with an injury. Know what to avoid, follow the rules, and stay updated on OSHA’s regulations. Let’s take a closer look at improving shoring safety on construction sites. When you know what kinds of problems are likely to happen, you can anticipate them and take steps to prevent them. The tricky part about shoring safety is that most of the problems that occur tend to be the result of human error. This could include failing to inspect the shoring before getting to work, carelessness on the part of the construction site, or accidents that happened because workers have been on the clock for too long. Recognizing the problem doesn’t automatically prepare you for it, but it helps you stay on your toes and avoid risky situations. Shoring projects are subject to Occupational Safety and Health Administration, or OSHA regulations. These rules apply to any scaffolding or shoring project and are designed to maintain safety. Workers must abide by these regulations and follow the correct safety procedures to minimize accidents when using work platforms or shoring. Just because you knew the standard safety regulations like the back of your hand when you entered the industry doesn’t mean you still know everything there is to know about shoring safety. As technology continues to find new places in every industry, there’s always more to learn about safety. Workers and supervisors alike should stay updated on the latest additions to shoring safety rules, regulations, and tips, so everyone can stay safe and the job can continue. No shoring system near Washington, D.C. is absolutely foolproof, but if you know what you’re doing, you should be able to stay safe on the worksite. If your company is in need of construction scaffolding or shoring, call Scaffold Resource at (301) 924-7223 to see what we can do.